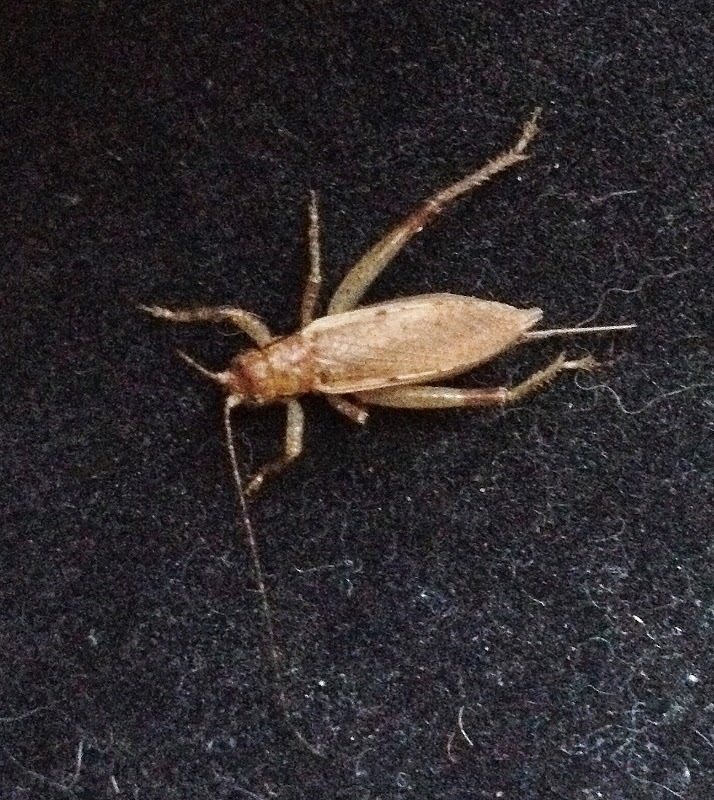 After a quick break to take the dog for a walk (“Not a euphemism,” as British comedian Miranda Hart would add), we had resumed our journey south on the New Jersey Turnpike when something on the car’s stick shift caught my eye – a cricket. A jumping bush cricket (Orocharis saltator), if I’m not mistaken (though I may well be – mixing uninformed amateurs and identification guides, such as Thomas Walker’s fun and useful Singing Insects of North America, often leads to foolishness). I suggested that my wife take a look; she did, offering only a mild sound of disapproval. With a tissue, she gingerly pried the little beast off the stick shift and tried to shake it out of an open window. Of course, given the air flow around the car, the cricket headed straight for the back seat where it rode in some comfort (I assume) for another two hundred miles (though part of a leg had been lost in the encounter with the tissue). Given this insect’s body plan and structure, even the alternative of being blown out of the car into the wilds of the Turnpike and the rest of New Jersey was not necessarily an immediate death sentence. Small size, exoskeleton (keeping the necessary, good parts encased in a skeleton), and wings spelled odds of survival that were not too bad. Insects are ancient survivors for some very good reasons. 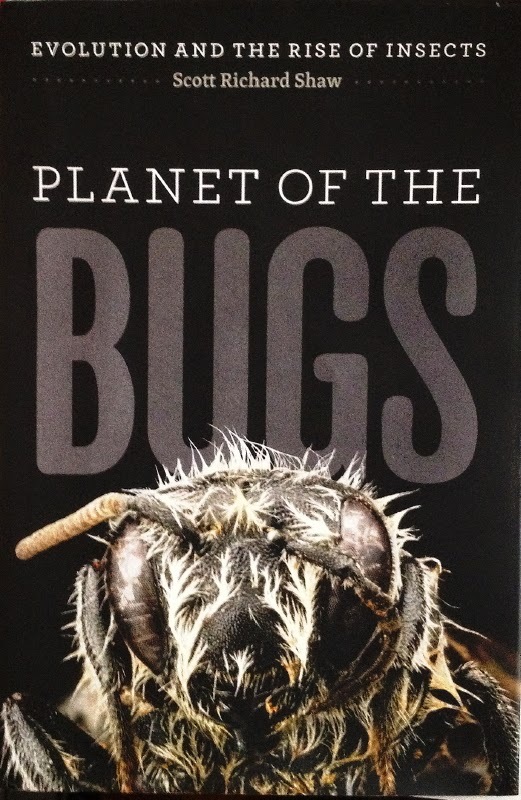 My current thinking about insects – their shapes, structures, behaviors, evolution, complexity, and beauty – has been informed by entomologist Scott Richard Shaw’s engrossing new book, Planet of the Bugs: Evolution and the Rise of Insects (2014). The prose in this book is graceful and the scientific content accessible, though still substantive. All in all, a pleasure. For me, by far the most exciting and fulfilling aspect of the book has to do with a simple, though fundamental question about insects, a question I’d never been smart enough to formulate. Think on the earthbound caterpillar munching on a milkweed plant and the highflying Monarch Butterfly that it will become, and ask, “Why does that happen?” Indeed, why do more than three-quarters of all modern insects undergo such a complete and complex metamorphosis in their lives? Shaw tells the tale of the evolution of life on this planet from a markedly distinct point of view, that of the insect. In doing so, he stresses that he is offering a necessary counterpoint to the human-centric way in which the evolutionary story is often told. (Indeed, we humans are displaced, though not missing, in this account.) It’s largely a chronological telling, a journey from the Cambrian to the present, in which he describes the evolutionary path that insects have followed. This is a story he tells well, covering the ground with a sure hand, freshness, and a sense of humor. His insect-centric view point is totally appropriate. The class Insecta is, after all, one of the planet’s greatest success stories with nearly a million known and named species, and many millions more unknown. Insects clearly have done well over hundreds of millions of years of evolution. The first true insect appeared on land during the Devonian, some 400 million years ago. The basic insect body plan apparently leaves little to be desired – three-part body with a head (housing brain, eyes, antennae, and mouth), thorax from which six legs extend (a pair from each thoracic segment, and wings, if appropriate), and abdomen (everything else is found there, most of the bodily systems – no wonder a squashed insect abdomen is mostly goo). Having the skeleton on the outside offers protection for precious organs. In addition, small size is an insect virtue, the truly big insects have gone extinct. Such smallness “allows bugs to divide the world into exceedingly small niches (p. 12),” and weather many storms that have taken out other animals. Among insects’ great accomplishments is flight. They were the first organisms to take to the air, stretching their wings initially in the early Carboniferous, some 327 million years ago, and monopolizing flight for the ensuing 150 million years. Reflective of Shaw’s informative consideration of the hows and whys of insect evolution is his treatment of the development of wings and flight. He’s not fond of the hypothesis that the attraction of tastier parts higher up plants got insects out of the soil to a jumping off point for flight. Rather, he offers an array of other possibilities: insects may have first climbed plants to gain some warmth with wings themselves favored by selection because they acted like “little solar panels” to warm these cold-blooded organisms, and, also, wings offered a canvas for colors and patterns to fuel courtship and mating, to camouflage their bearers, or to warn off predators. Speaking of predators, flight itself might have been selected for because it offered a means of escape from predators (a recurrent theme in any evolutionary story), or a way to spread the wealth and colonize large areas. Nevertheless, when Shaw puts the parasitoids into an evolutionary context, one can appreciate the behavior. Finally, I have to add that, thankfully, Shaw avoids the trap that ensnares many writer of popular natural history – the first person narrative in which the author becomes the story’s hero. Only on occasion for me does such a book succeed, more often not. Shaw interjects himself into the narrative only sporadically and mostly to good effect. So, yes, I'd say I like the book.